Cynthia Schoeman has been working in the field of workplace ethics for over a decade and shares her extensive knowledge and experience in her latest book, Ethics Can. The title of this book Ethics Can lives up to its promise. In addition to dealing with more recent issues such as cybercrime, social media and supply chain ethics, the content is an illustration of how ethics permeates every aspect of the workplace and presents a great business case for ethics. The book offers a clear and systematic treatment of business ethics, and is laced with valuable insights, practical examples and suggestions, guidelines for implementation and useful questions for workplace discussions. If you are uncertain about how to take ethics from concept to implementation, read this book - and keep it for regular future reference. This book is a highly recommended publication for ethics practitioners, leaders and managers who deal with ethics, students who are studying ethics and for anyone who is interested in making a positive ethical difference in their workplace. The concept of ethics is probably as old as humanity; certainly it stretches back to the ancient Greeks. Its roots lie in “doing the right thing – even when no-one is watching”, and that, in turn, probably ties in to the old biblical injunction: “Do unto others as you would have them do unto you.” In essence, a high standard of ethical behaviour becomes a recipe for a frictionless social and business life. All of which makes it quite alarming that modern ethical standards, especially in business, have fallen so low. Author, trainer and business ethics expert Cynthia Schoeman is determined to change that, arguing that, if nothing else, good ethics makes good business sense. Her argument’s moral dimension has recently been given some very sharp teeth by changes to the Companies Act as well as the recommendations of the King Committee on Corporate Governance. Her latest book – Ethics Can – is a meticulously researched text that will tell you everything you need to know about the subject: what we mean when we talk about workplace ethics, whose role is ethics in the company, managing workplace ethics and how to implement a monitoring and reporting programme. It’s also structured in such a way that you could use it in the workplace as a primer to stimulate discussion and allow these critical issues to surface. Highly recommended. The title of this book “Ethics Can” lives up to its promise. In addition to dealing with more recent issues such as cybercrime, social media and supply chain ethics, the content is an illustration of how ethics permeates every aspect of the workplace. The book is packed with practical examples and each chapter contains useful questions for workplace discussions and recommended reading. That the author eats, sleeps and breaths ethics shines through. If you are uncertain about how to take ethics from concept to implementation, read this book. And keep it for regular future reference. Cynthia Schoeman is at the forefront of promoting business ethics in South Africa. Drawing on her extensive knowledge and experience, she has written an exceptional book. It offers a clear and systematic treatment of business ethics, and is laced with valuable insights and practical suggestions. Cynthia is an accomplished ethics professional and writer and I have had the pleasure to deal with her and attend several of her presentations on quite a few occasions in the past. As soon as you start engaging with Cynthia, you realise that she has a passion for ethics and the expertise to influence and be a catalyst for change. What a pleasure to finally read a book about the practical implementation of ethics in organisations and it makes perfect sense. As an ethics practitioner of nine years I had to find my own way around the corporate landscape addressing ethics in business. My life would have been made much easier if I could have an ethics ‘bible’ like this with me to guide me, support me and in fact tell me what ethics in business is all about. We sometime s tend to focus too much on theory and then get bogged down in philosophy without knowing how to determine and implement the solutions. Cynthia has a relaxed and cheeky writing style, making learning about ethics an absolute pleasure. It is sometimes difficult to present a good business case for ethics as it usually involves a loss in short term profits and a focus on long-term sustainability. Cynthia makes an effective and succinct case and brings it home with workable examples. The chapter on ethical leadership is especially close to my heart. Cynthia focuses on all the relevant aspects of an ethics programme as well as the case studies and tools to assist with implementation. This is a highly recommended publication for any ethics practitioner and I will be one of the first to invest in Cynthia’s book. 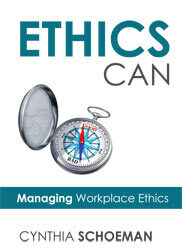 Ethics can is a book about ethics in the workplace. The title of the book probably warrants an explanation. It derives from the Bloomberg Businessweek 2014 Design Issue which included input from the many people who took part in their second annual design conference. A particularly noteworthy exchange was captured with Neville Brody, head of Brody Associates and dean of the School of Communication at the Royal College of Art in London. Asked to fill in the blank, “Design can ________”, he replied, “That’s the full sentence. Design can. Ensuring that the world’s population has access to water, food, sanitation, a roof over their heads – all of that is design.” Maybe the better question is “What can’t design do?” (Bloomberg Businessweek, 2014). One can debate the vast extent of Neville Brody’s claim about design and it will be for history to judge whether President Obama’s motto did translate into major positive change. However, the applicability of the “blank space” exercise to ethics was very apparent. “Ethics can” is also the full sentence. Ethics can build trust; it can create pleasant, productive workplaces that are characterised by high levels of fairness, respect, accountability and responsibility; it can foster sound relationships with internal and external stakeholders; it can position the organisation as an employee of choice, attracting and retaining the best talent; it can boost the organisation’s reputation and brand equity; it can create a high degree of customer and investor confidence; and it can and should be a key differentiator that accords ethical organisations a unique source of competitive advantage. In short, ethics can make all the difference. Understanding workplace ethics beyond just what is right and wrong. Illustrating why ethics makes such good business sense, which aims to enable leaders and managers to motivate an ethical business focus well. Establishing whose role is ethics, which explores the role of leadership, the social and ethics committee, and HR. Managing workplace ethics, which outlines a comprehensive ethics management system and includes a detailed focus on topical workplace issues. Discussing the crucial tasks of measuring, monitoring and reporting on ethics and ethical performance. Exploring ethical decisions and dilemmas, which examine how to make those really tough ethical decisions. The themes and topics are applicable to organisations in all sectors and across all industries. While the burning issues or the emphasis may differ, the fundamentals, such as ethical leadership and a sound ethics management system, are necessary in all organisations. A pertinent feature of the book is that it is made up of a collection of separate, stand-alone articles that have been grouped thematically based on the issues and challenges that are most pertinent in the workplace. Thus instead of necessarily having to read the book from cover to cover, the structure allows the topics to be read individually, as and when those issues arise or based on the reader’s specific interest or area or responsibility. Finally, in answer to the question of why I wrote this book, there are a numbers of reasons. For all those who strive to maintain or improve ethics in their workplaces, it is intended to be a quick and easy reference of best practice guidelines and to provide them with practical support to help them manage ethics even better. For those who are not yet fully convinced about ethics and its relevance, I hope this book will be persuasive. For organisations, the book can serve as a very useful resource. It can form part of a training programme and be given to executives, leaders and managers who have the responsibility of managing the ethics of their followers – or, in fact, to any employee who is interested in knowing more about ethics since the more widespread the knowledge and understanding of ethics is, the more it becomes the norm in terms of behaviour. But, above all else, I wrote this to share my knowledge and understanding in a clear and accessible manner so that it can contribute to building a great community of people who are both committed and competent to make a difference as regards workplace ethics – and because that difference is so sorely needed.